You are here: Home » Mindy’s Beer Gear Looks Like an Awesome Holiday Gift! Mindy’s Beer Gear Looks Like an Awesome Holiday Gift! Mindy Humphrey is doing something creative, unique, and good for the planet. She takes old beer boxes and “repurposes” them into useful items you can use every day. These are some pretty cool items for the craft beer geek on your Christmas list. Mindy has created items such as wallets, luggage tags, wrist bands, hair bands, and even purses from recycled beer boxes. It is obvious that she isn’t in this to get rich, as her prices are very reasonable. 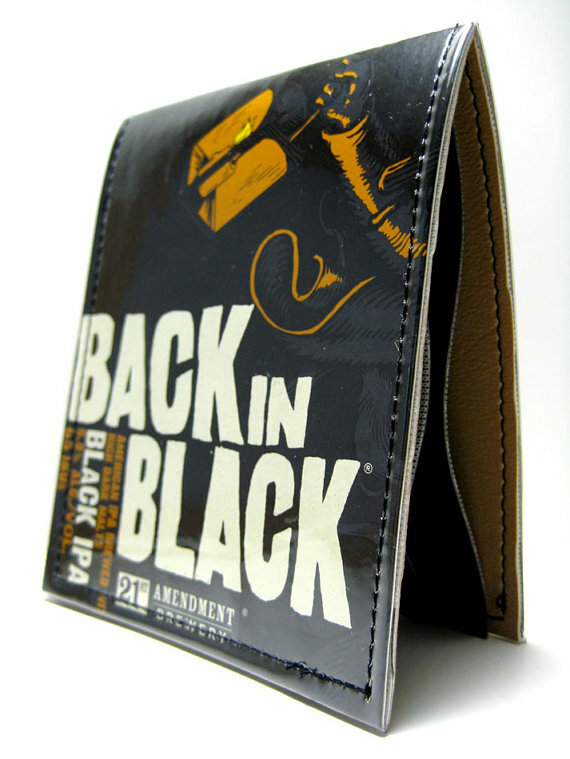 The Back in Black wallet pictured above is only $16 with $2.50 for shipping. She makes everything out of vinyl so all her creations are vegan friendly and won’t cause cows to grimace. You can see hers stuff here on Etsy.com. Mindy also wants to please. If you don’t find something with a logo that interests you, you can send her a box and she will custom make the item you wish. What is more if you do this, she doesn’t charge shipping for the item you purchase! These are really cool, and for light duty use I think would be a great addition to any craft beer lover’s wardrobe. Mindy has this disclaimer she posts on her site. DISCLAIMER: Mindy’s Beer Gear is not licensed product of the brewery their materials came from. Mindy’s Beer Gear items were created in my shop. MindysDesigns is in no way trying to compete with or duplicate any products sold by the breweries. All materials used were obtained by purchasing & consuming the product. Those materials were then upcycled and turned into something new instead of throwing them away and filling some landfill. MindysDesigns makes beer gear because she loves beer and supports breweries in the craft/micro beer world. I always like to support someone who wants to make an honest product, and is interested in a lot more than just a huge profit. So in the interest of Craft beer, try giving the beer geek on your list something unique and personal. They’ll thank you for it. Tags: featured, Mindy's Beer gear, No cows were harmed in the making of these beer geek wardrobe items! ← Guess Which Brewer is Getting Their Own “Reality Show”? Hey Mindy (if you ever check out this post) can you tell us how durable your gear is? Do you do anything special to the cardboard to make it extra tough or is it the standard box coating? Hey! Thanks for the write up guys! You nailed it with my view on what I’m doing. I started making this stuff for myself and my brother. Everyone liked it so much I decided to share and it’s been growing every day since (about a year ago). I’m still taking custom orders for Christmas. That will probably last until this Friday. After that, I can’t promise you will get your items in time to stuff those stockings. I do events in the Portland area. Follow me on Twitter to see where I am each weekend. And, I offer wholesale pricing for breweries. Beer people are the best. My stuff is very durable. My brother is in a world-touring band and his wallet has lasted him a year already. I’ve been carrying a six-pack purse for a year and holding strong. I do not laminate. That would leave raw edges. I cover all my stuff in clear vinyl fabric. It is completely wrapped in vinyl. Sweet! These are very cool, but I was concerned that they wouldn’t hold up. Doing my best to stay away from any jokes. Thanks Don; I just bought my son-in-law a Heavy Seas wallet! And here’s something similar but different for all of your fisherman friends who like beer. (And what self respecting fisherman doesn’t?) A little spendy and it’s not clear if he does special orders. But kinda cool, if you’re into lures and such. But will they catch fish or just fishermen? Craft beer is the reason I no longer need a wallet.